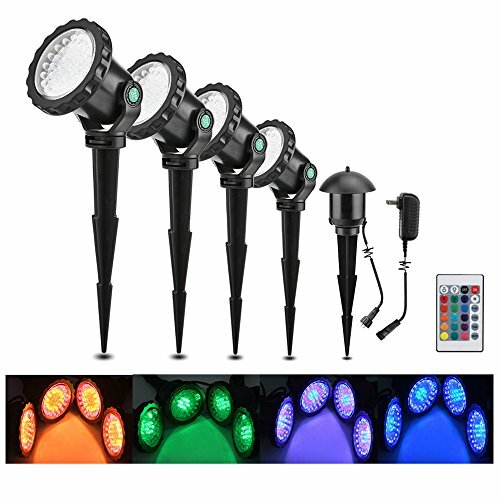 Lemonbest Set of 4 LED Multi-color Spotlight Garden Decorative Landscape Outdoor Pond Yard Lawn Light Submersible Lamp Remote control w/Spike Stand | Fountain City Art Ctr. Each light comes with 36 LED chips. 180 degree adjustable direction. Can be mounted by the spikes. Adjustable lights direction lets you point the light at different angles. Remote controlling 16 kinds of static effects and 4 kinds of dynamic effects. The brightness of static effects and the speed of dynamic effects are adjustable. Remote control effective distance is 2m/6.6ft. Ideal for garden, yard, lawn decorating and lighting, fountain or pond, pool, enliven the garden pond to get ideal atmosphere and beauty. No memory function, turn on the light, it will be automatical changing mode. Cable length from the power adapter to the remote sensor receiver is about 5m / 17ft, and about 2.2m / 7.2ft between two spotlights, convenient to use. Comes with 5 pcs 16cm/6.2" spike stands, easy to fix into the soil or lawn. Factory directly sell, 100% Brand NEW, 1 year warranty! Please note that each light is made of 3 circles of different led beads, it is not the pure single color. 24 key remote controller easily control within 2m/6.6ft effective distance. Can set 16 static color effects and 4 kinds of dynamic color changing modes. 4 auto-changing lights modes: flash, strobe, smooth, gradual changing. The brightness of static colors and the speed of dynamic effects are adjustable. Please note that each light made of 3 different colors LED beads, will not come out pure single color light, the light is mixed color. 16 static color light options: red, blue, green, yellow, orange, purple etc. 180 degree rotation light body, you can adjust it to the best lighting angle as you like. This set of the spotlights includes 5 spike stands, for plugging the light into your garden lawn, or underwater soil in pond, make your place full with dramatic atmosphere. IP68 waterproof grade, widely use in garden landscape, park, rockery, pool, pond, corridor, path, fountain or other places need decoration spot lighting. If you have any questions about this product by LemonBest, contact us by completing and submitting the form below. If you are looking for a specif part number, please include it with your message.